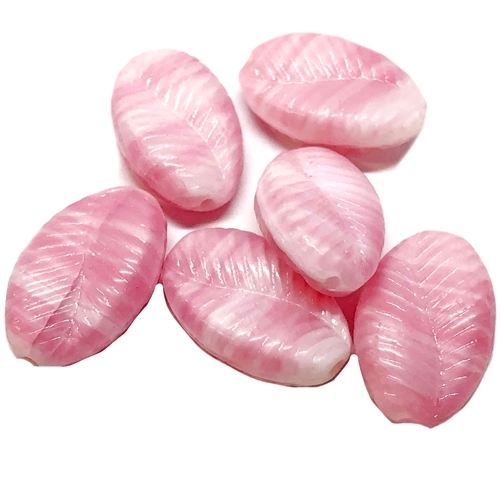 Twisted pink glass leaf beads, glass leaves, beads, jewelry making, rare Cherry Brand. Measures 18 x 12mm. Sightly twisted flat oval beads look like leaves and are made of two tone pink and white combination glass. The beads have a curved line running down the middle on both sides along with a engraved pattern of lines radiating from the center to the edges. Beautiful leaf beads, drilled from top to bottom. Natural properties of the glass produces a slight color variation from bead to bead. Made in Germany in the mid 1960s. Sold by six (6) piece packages.